No peanuts or peanut products will be sold or let into FirstEnergy Stadium on Thursday, August 22. Peanuts and baseball have gone together since 1908 when "Take Me Out to the Ballgame" was written by Jack Norworth and Albert Von Tilzer. For some fans a day at the ballpark wouldn't be the same without a bag of peanuts, while others can't even attend a game with the threat of peanut shells in the air. Peanut allergy is one of the most common food allergies. Children with this allergy has been on the rise over the past decade, and usually battle for their entire life. Peanuts can cause a serve, potentially fatal, allergic reaction from peanut and peanut products. 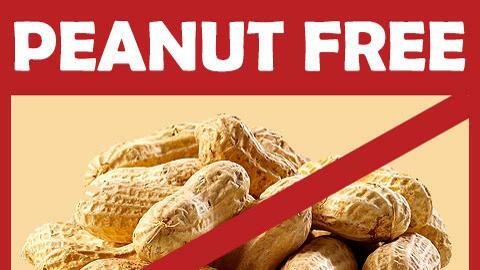 Trace amounts of peanut can cause an allergic reaction. On Thursday, August 22 the Reading Fightin Phils have decided to have a food allergy awareness peanut free game to accommodate these fans. This will give fans with a peanut allergy the opportunity to watch America's pastime live and in person. On Thursday night, no peanuts or peanut products will be sold inside of FirstEnergy Stadium for the first time this season. Red section 5 have been steam washed, cleaned and designated as the peanut allergy section. Not only can fans finally come out to a game without fear of peanuts, they can also sit together with fellow fans who suffer from this allergy during the Fightin Phils game. Thursday night the VIST Bank Plaza gates will open at 5:00 pm for a happy hour with $1 off beer and a pre-game concert featuring Vuja De thanks to Miller Lite. Members of the Redner's Fightin Phils Kids Club can enjoy a happy half-hour from 5:00-5:30 pm with free Phunland. There will also be Berks Bards Poetry Contest. The seating bowl opens at 6:00 pm for the 7:05 pm game. There will be a post-game fireworks show thanks to Pepsi. Following the fireworks Vuja De will perform a post-game concert thanks to Yuengling. Tickets are available online at Fightins.com, calling the Fightin Phils Ticket Office at 610-370-BALL, or by visiting the Fightin Phils Ticket Office in person at FirstEnergy Stadium.